Priority Mail: This is the de facto standard method of shipping for eBay users. The promised delivery time is two to three days, although sometimes there are rare delays of up to a week during peak holiday periods. Priority Mail costs as little as $5.05 for a 1-pound package within your local zone when you print your postage electronically. The fees go up and are calculated according to weight and distance unless you’re using Flat-Rate boxes. A $5.60 Flat-Rate Priority envelope is also available. You can ship as much stuff as you want — as long as you can fit it into the supplied 9½ x 12½ envelope. (You’ll be surprised how much you can jam into those envelopes.) You can reinforce the envelope with clear packing tape. Using flat-rate Priority Mail boxes (which come in a multitude of sizes), you can send heavy items at reduced rates. Order the boxes directly from the USPS. To order your boxes, labels, forms, and just about anything else that you’ll need to ship Priority Mail, go to the Postal Store. Orders can take up to a month to arrive, so be sure to order before you need more boxes. To save money, print your postage electronically. You can do this through a service such as Endicia.com, stamps.com, eBay, or PayPal. Express Mail: If the item needs to be delivered the next day, use Express Mail. The Postal Service promises delivery no later than noon the following afternoon (even on weekends or holidays). And you get free boxes. Cost? 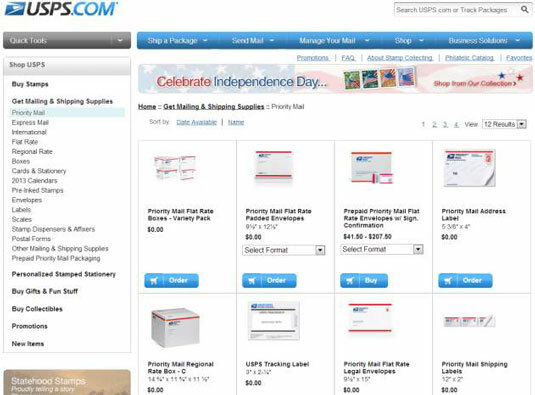 Express Mail runs $14.10 for packages 8 ounces and under. Express Mail also has a Flat-Rate envelope, which is the same size as the Priority Flat-Rate envelope and ships for $19.95. (When you print your postage electronically, you save about 5 percent — with the aforementioned items at $13.09 and Flat-Rate at $18.11). The Postal Service offers a free special pickup for Priority Mail and Express Mail, no matter how many separate packages are included. If you have several packages, carrier pickup is an excellent option. First-Class Mail: If your item weighs 13 ounces or less, you can use First-Class Mail. First-Class Mail is considerably cheaper than Priority. Ship as much as you can via First-Class mail so you can have the edge on other sellers by offering lower shipping prices. Media Mail: This is a popular option among those who sell books on eBay. It’s the new name for two older products, Book Rate and Special Standard Mail. Media Mail rates start at $2.53 for the first pound and increase by $0.45 for each additional pound. It’s cheap and convenient, but your item can take up to two weeks to arrive. Other options: The Postal Service offers all sorts of add-ons. Get a tracking number, because PayPal requires it as proof of the shipment. You can add it to Priority Mail, as well as with other mailing services such as First Class or Standard Post (previously known as Parcel Post). The cost is a mere $0.70 — and free on electronic purchases. It buys you the knowledge of when and where your item was delivered. Not only that, but if a buyer reports to PayPal that he or she wants a refund because an item was never received, the scan on the tracking number prevents you from getting a chargeback. For items over $250 in value, you need a signature confirmation — as well as shipping tracking information — to cover your shipment under eBay’s Seller Protection. You can check on whether the package was delivered (or whether an attempt was made to deliver it) by typing the number online. You can also click the link to the tracking number in My eBay or PayPal after you’ve copied the number into the sales record. Tracking numbers come in handy if you try to collect insurance for an item that was never delivered or if the buyer says the item was never delivered. It gives you proof from the Postal Service (or other shipper) that the item was sent. If your package gets lost in the mail for a few weeks, this number won’t always reveal the location of your package until it’s delivered. The USPS website gives you an overview of the U.S. Postal Service rates so that you can see all your options. It sure beats standing in that endless line! Even better, USPS has a page that can help you determine exactly what your item costs to mail (after you’ve packaged it and weighed it, of course). Start at the Rate Calculator page and follow the instructions.